You’ve probably heard about a sit-stand desk and maybe even seen one. It’s one of the latest ergonomic office trends in promoting health and wellness. Here we’ll give you a brief explanation of what exactly is a sit-stand desk why its become so popular as well as provide recommendations to get you started. Sit-stand desks are desks that can be used while sitting or adjusted to a height more appropriate for standing. This allows you to alter your position throughout the day, an action that is better for your back and overall well-being. Sit-stand desks typically feature more mechanics than a regular desk, such as a hand crank or pneumatic lift that add the necessary height to make standing comfortable. Your posture is a significant aspect of spending all day at a desk. Even with the best chair that provides optimal support for your body, you should still get up and move throughout the day. With a standing desk, moving is more possible. You’ll shift your weight from one leg to the other and could even walk in place to increase blood flow to your entire body. One Forbes contributor wrote that he felt he had more energy when using a standing desk and that his back and tailbone were far less sore after several hours standing. Cia Bernales, a web producer at Fast Company, used a standing desk for a year and claims she’ll never return to a normal office chair. She previously experienced tight shoulders, fatigue, and lower back pain and moved to a standing desk in hopes it would alleviate her symptoms. After some getting used to, Bernales was standing eight hours a work day. Her posture improved and she took more frequent, short breaks to improve her productivity. Another major benefit of sit-stand desks is the potential for burning calories. A study published in the Journal of Physical Activity and Health found that a person’s VO2 max, or maximum oxygen intake, increases while at a standing desk. This leads to a rise of burning an extra 9 calories an hour. A loss of 270 calories per week by making a simple switch to a standing desk can be a huge win. Sit-stand desks can benefit entire companies because they promote better posture and reduce the negative effects of sitting all day. Your employees may be willing to stay longer to finish their work because they are not experiencing back pain. 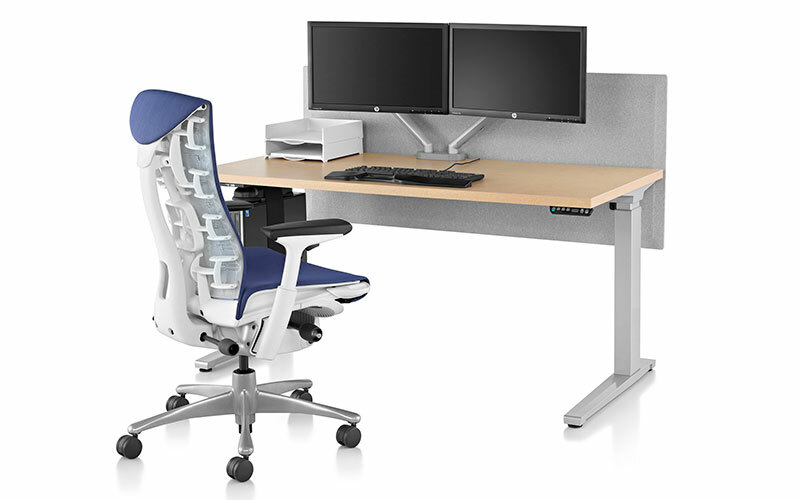 This modern desk features refined sustainability, ergonomic support, and a height-adjustable workspace. The style goes well in a mod gray-scale office or even at home. As the name suggests, this desk nearly floats from one height to the next with just the use of one hand, making the move from sitting to standing easy and effortless. Furniture designer Brian Alexander created this innovative table that provides a full range of supported movement. You can change from sitting to standing with just the flick of a switch. The table also features cord control to keep your chargers accessible but out of sight. Steelcase’s sleek, modern design for this table promotes healthy posture, movement throughout the day and appealing aesthetics. 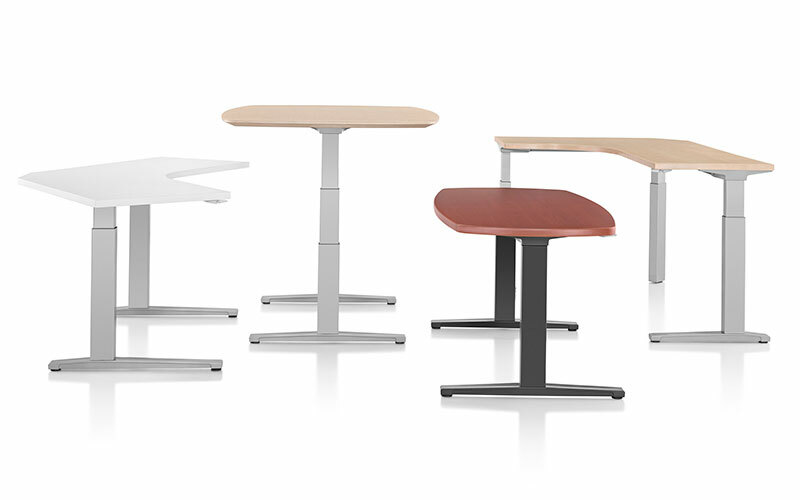 Adjustment buttons alter the height of the table within seconds for easy changes from sitting to standing. This standing desk features pneumatic lifts that adjust the height of the work surface to your liking without disturbing your computer or desktop items. It looks great in conference rooms, open offices and at home. With a simple hand crank, you can transition this sit-stand desk from a high height to a lower one. With many top, edge, and grommet finishes, this table will fit in well in any office. The post Sit-Stand Desks That Will Change Your Work Life appeared first on Office Designs Blog.